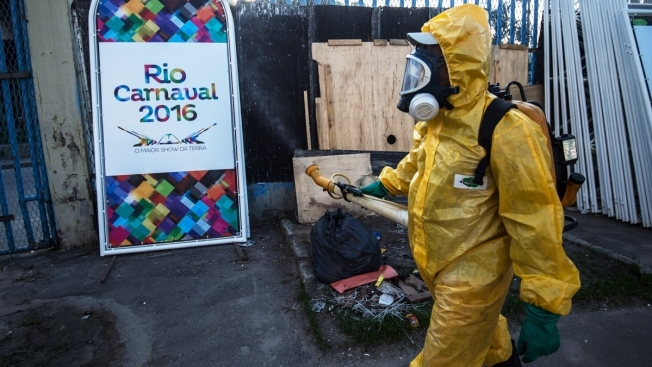 A health worker fumigates an area ahead of the Carnaval in Rio de Janeiro, on Jan. 26, 2016. Health department workers are spending the week spraying insecticide up and down the streets of Brazil's major cities, trying to kill as many mosquitoes as possible before Carnival. The giant festival of parades, music and dancing attracts millions of visitors from around the world. As crowds pour into Recife airport, they're met with bands and warnings, according to NBC News. Staffers in mosquito-decorated T-shirts offer information about the Aedes aegypti mosquito that's spreading the virus across Latin America and the Caribbean. "In a couple of days we will have about 1.5 million people on these streets during Carnival," said Jailson Correia, health secretary for the northeastern coastal metropolis.